Elegant yet relaxed, this is a warm room designed for gathering. The space is richly layered with rugs, furniture, and textiles and the metallic ceiling gives it a fresh and spirited look. With the purchase of a new home, the owners needed a room for entertaining or for kicking back with the family. Peabody’s designer Tami Stephens relished the opportunity. She was inspired by a classic cigar lounge atmosphere to create this comfortable and stylish room that will stand up to constant use. Club chairs are covered in velvet, a chesterfield sofa upholstered in leather is placed next to a steamer trunk that serves as a coffee table. A rolling bar cart is accessorized with cut crystal. 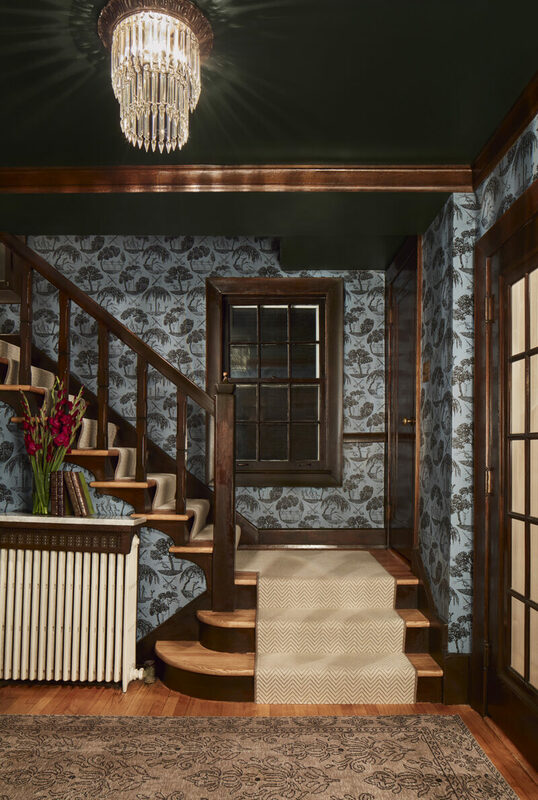 Jewel tone colors, playful patterns and metallics update the look and coordinate with the homes traditional architecture and original chandeliers.